These were a pair of camo pants from my son. I do not know why I still had them hanging around, since he is so much bigger now. 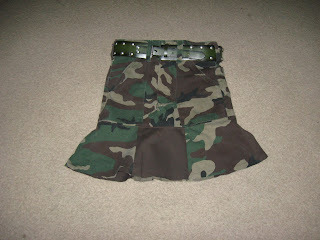 But lucky for me, my little beauty girl really wanted a camo skirt. So, I cut off the pants, and pieced together a ruffle skirt, attached it and......Tada!